The “In-touch” robot is one technology that can work all over the world. Through a simple lap-top computer a doctor can reach out across the globe and “see and be seen” by the patient and have a conversation with the patient. 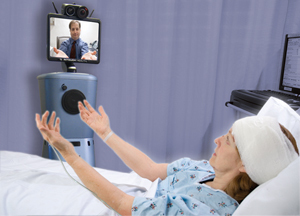 The robot is mobile and can be remotely navigated from room to room (or hospital bed to hospital bed) and “visit” the patient. A dermatologist can see the skin and recommend treatment. The robot can perform electronic stethoscope, otoscope and ultrasound and transmit that data back to the physician. We are using this technology to provide care to rural community hospitals in Northern California that cannot get certain specialists in the community. We are also able to provide remote night medical coverage so patients can stay in their own community and not be transferred to larger hospitals for care. Many conditions can be managed well in the rural hospital with physician expertise to evaluate the patient and prescribe treatment. Patients and their families love it and it saves in cost, transportation and inconvenience. The robot is also providing needed expert consultation for a hospital in Haiti and a rural hospital in Kolwezi, Democratic Republic of Congo. Specialists are donating their time to be “on call” and provide support to the patients and care-givers there. Imagine the benefit of having consultation for a high-risk pregnancy or neurology or pediatrics or any number of medical conditions. I wrote about this technology way back in 2007 and now the robot is being used far and wide.